Fill out our simple form and get quotes from local party tent hire companies. What’s the occasion? No matter what you’re celebrating we can help you find a party tent for your event. Create a wonderful space for your party that is perfectly tailored to suit your needs. Party tent hire is simple, you just need to find the right supplier. Complete a free quote request form here. With a diverse range of marquees furniture, lighting & accessories, we really can help you put on the party that you'll remember forever. 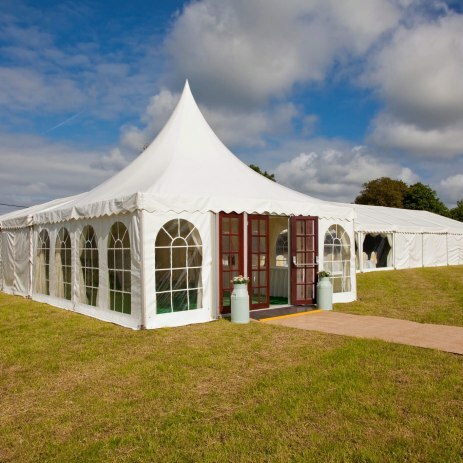 The Rocking Marquee Hire Co offer's a easy and cost effective way to book a marquee. Supplying Marquees in Essex & Hertfordshire for any occasion or event. We’re a family run business based in Gloucestershire and supply the coolest high qulsity Party Tents for any event! Our party bells can come as a blank canvas bell tent or we can style your party tent from themed garden parties to festival chill outs. Our bells will turn heads and impress your guests. Why not incorporate our smaller Capri with some rattan furniture to create a party/chill out tent? What will you be using the party tent for? From sophisticated garden party tents to huge structures for weddings and big celebrations, getting your party tent hire right can really make your event come to life. The main purpose of a party tent is to create a new space that’s weatherproof, practical and houses your guests, entertainers and caterers perfectly. To make sure your party is thoroughly enjoyed by all, your chosen party tent supplier will erect your tent, fully set it up for you, then take it away after your event. There are plenty of options for decorating your party tent, it will arrive as a blank canvas and you can either arrange decorations with your supplier or get creative and personalise your party tent decor yourself. Find suppliers in your area here.